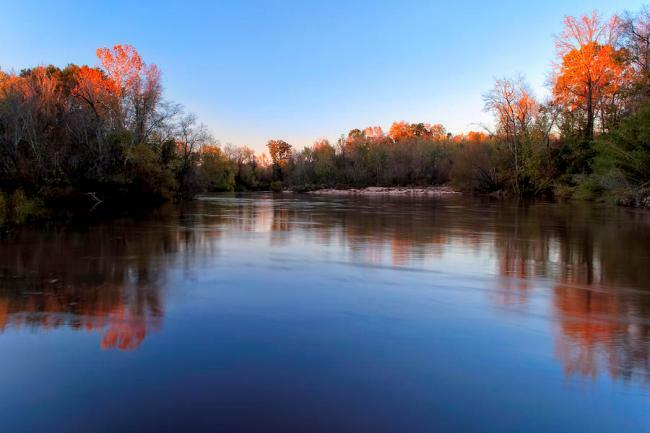 The Flint River, which stretches from the Piedmont to the Chattahoochee River in southwest Georgia, is one of only 40 rivers in the nation's contiguous 48 states that flow unimpeded for more than 200 river miles. The Flint River has an unusual source. It begins as groundwater seepage in west central Georgia at what is today the mouth of a concrete culvert on the south side of Virginia Avenue in Hapeville, an Atlanta suburb. The water that collects there quickly disappears under the runways of Hartsfield-Jackson Atlanta International Airport as it flows southward through the culvert and eventually through Macon County to southwest Georgia. The Flint River offers many recreational opportunities to Macon County visitors. Boating and fishing enthusiasts can choose from two accessible public access boat ramps, Hooks Landing between Oglethorpe and Montezuma on Highway 49 and Crooks Landing between Montezuma and Marshallville on Highway 49. The Flint is showcased during the annual Flint River Paddle sponsored by the Georgia Conservancy and the new Paddle Georgia Fall Float on the Flint River in October 2014. This event travels 70 miles on the Flint River from Albany to Bainbridge taking in the best of the Flint -- beautiful blue hole springs, lively rapids, rich history, abundant wildlife and more! Fashioned after the annual week-long Paddle Georgia events, participants tent camped at Chehaw Park and on the river two nights at Rocky Bend Flint River Retreat. Like the annual summer adventure, participants enjoyed catered meals, educational programs and great camaraderie as they made their way down one of Georgia's most beautiful rivers during a beautiful time of year. For more information about these events visit the Georgia Conservancy Website. Originating near Atlanta, the river flows south for more than 200 miles, feeding two power-producing lakes along the way, as well as providing farmers with water for crop irrigation. The length of the river depends on how one defines length: a boater would cover nearly 350 miles in the Flint's meandering channel within a basin measuring only 212 miles in length. The river passes through two power-generating lakes -— Lake Blackshear near Cordele and Lake Chehaw near Albany -— before it meets the Chattahoochee River 265 miles downstream from its headwaters at the Jim Woodruff Lock and Dam and creates Lake Seminole in the southwest corner of the state. The single river that leaves Lake Seminole is known as the Apalachicola, which flows through Florida to the Gulf of Mexico. The Flint River flows through the Montezuma Bluff Wildlife Management Area, a 500-acre stand of relatively undisturbed mature hardwood forest. The damp, shady slopes sheer off in a 150-foot escarpment of eroded limestone to form a spectacular bluff overlooking a towering beechwood swamp. Boaters can enjoy magnificent views of the bluffs while exploring the swampy creeks and sandbars below. Trails are open only to foot traffic. Between the Flint's urban beginning and its reservoir ending, its watershed -- which includes the cities of Montezuma and Marshallville -- drains some 8,460 square miles. This watershed can be divided into three distinct regions, the Upper, Middle, and Lower Flint, based on landscape, channel characteristics, flora and fauna. The river is thus home to an abundance of unusual animals and plants. Unique to the Apalachicola-Chattahoochee-Flint system are the shoal bass, which is highly prized among fishermen, and the Halloween darter. The Halloween darter was discovered in the early 1990s by researchers at the University of Georgia's Institute of Ecology (later Odum School of Ecology), who in 2009 gave the small fish its scientific name of Percina crypta. The Flint is also home to more than 20 species of freshwater mussels. The Lower Flint contains springs and caves, which are home to the Georgia blind cave salamander and the Dougherty Plain cave crayfish. The shoals spider lily, discovered in the 1770s by naturalist William Bartram, can be found on the Flint, along with greenfly orchids, corkwood, needle palm, and the very rare relict trillium. The Flint River's Atlantic white cedar swamps are the most distant from the coast to be found; these trees are usually encountered in such locations as the Great Dismal Swamp in Virginia and North Carolina or peat bogs in New England. White settlers poured into western Georgia to farm the land between the Flint and Chattahoochee rivers in the early 19th century, often setting up large cotton plantations. In 1828 the Apalachicola-Chattahoochee-Flint river system began supporting steamboat travel. By 1860 more than 26 steamboat landings dotted the Flint between Bainbridge and the river's junction with the Chattahoochee. Steamboats traveled upriver as far as Montezuma until the sandy, shifting riverbed of the Middle Flint proved too treacherous. Steamboats below Bainbridge continued to thrive and remained in operation until about 1928, mostly to ship cotton to the port of Apalachicola. Smaller boats and barges traveled from Bainbridge to Albany. While steamboats navigated the Flint lengthwise, numerous ferries traversed the river. The last ferry across the Flint, near Marshallville, closed in 1988. The combined effects of the Civil War (1861-65), soil erosion, the boll weevil, and the Great Depression of the 1930s devastated Flint region farmers, who gradually diversified their crops to include peanuts, soybeans, vegetables, and wheat. Dairying and the raising of cattle and hogs also became important to the area's agricultural economy. Agriculture remains important to this region, and use of the Flint's watershed for irrigation is a topic of keen interest and hot debate. Early industry consisted mostly of gristmills, using waterpower from the Flint's tributaries. Natural disasters have also thrust the Flint River into the headlines. In early July 1994, the tropical storm Alberto stalled over western Georgia. Not only did runoff from the city of Atlanta dump millions of gallons of water into the Upper Flint, but the storm dropped enough rain on southwest Georgia to submerge some cities, including Montezuma and Newton, and to cause the worst flood in Albany's recorded history. Numerous counties in the Flint basin were declared federal disaster areas; at least thirty-one people died, including fifteen in Americus and four in Albany. A second flood in Albany in March 1998 prompted plans for a levee, which are still being argued. Excerpted and adapted for this site from The New Georgia Encyclopedia.